There’s a lot to be said for liminal spaces. When you’re transitioning from one place to another, you’re in both spots at once—and you’re nowhere, too. 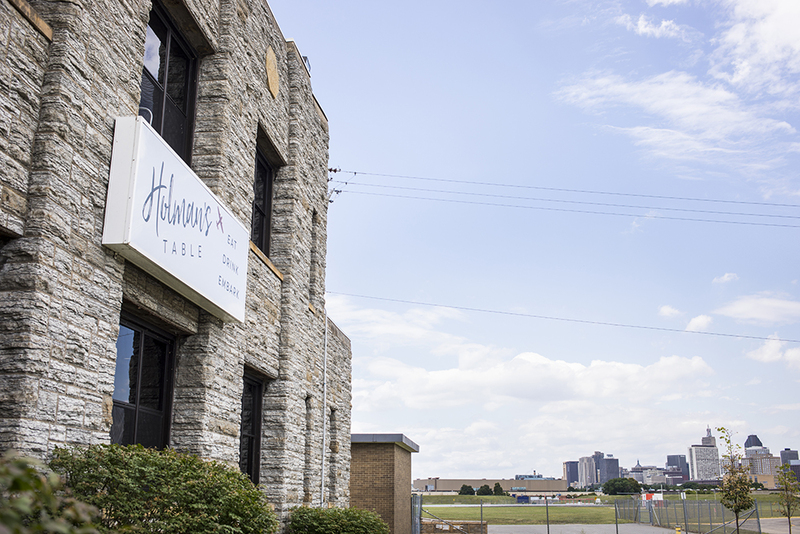 In that regard, Holman’s Table—the restaurant housed within the St. Paul Downtown Airport’s adorable moderne-style administration building—is a real doozy. You’re at an airport, yes—halfway between Minnesota and nearly anywhere in the world, given enough effort. And if you’re most people, you’re also somewhere between a middle-class existence and the world of the ultra-wealthy—much of the airport’s traffic is corporate and private jets, which exist to speed the one percent between places they have to be and places they’d like to be, with the greatest amount of comfort and convenience allowable by money. 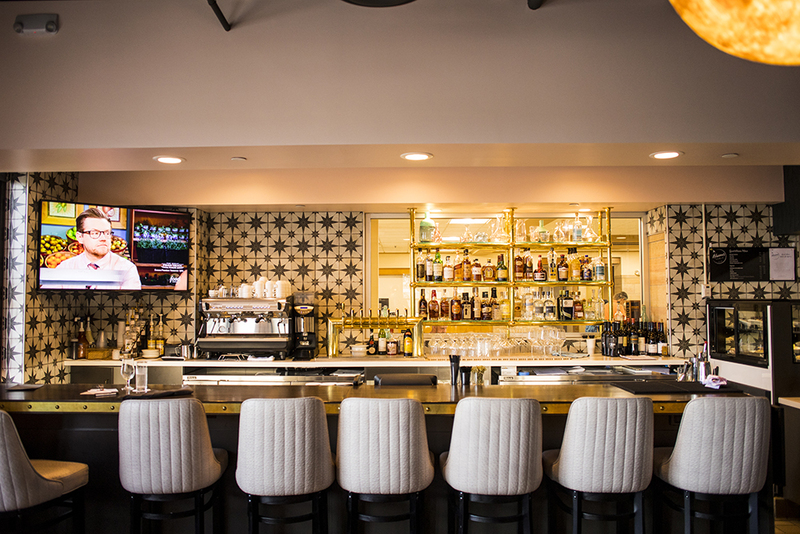 Our optimistic hope was that by dining at Holman’s Table, we might uncover another top-flight St. Paul dining experience that would otherwise be overlooked—a secret Meritage, a hidden Saint Dinette, a clandestine Octo Fishbar. We got closer than we expected. Pesto pasta ($16) tends to be a snooze of dish—watery, gritty, one-note. The Holman’s Table version was surprisingly bright, luscious, and engaging, with perfectly al dente noodles and a rich, bold sauce that clung to the pasta, coating each strand completely. We added a piece of medium rare sushi-grade salmon for $8 and it was a clutch move. The salmon was surprisingly large, with some lovely exterior browning and a tender interior. It added a ton of interest (and some protein) to an already interesting meal. The dish tasted under-salted, but between the herbs and salmon, it didn’t matter—there was plenty going on and we were utterly content. I raise salt here because it became a theme of our meals at Holman’s Table. 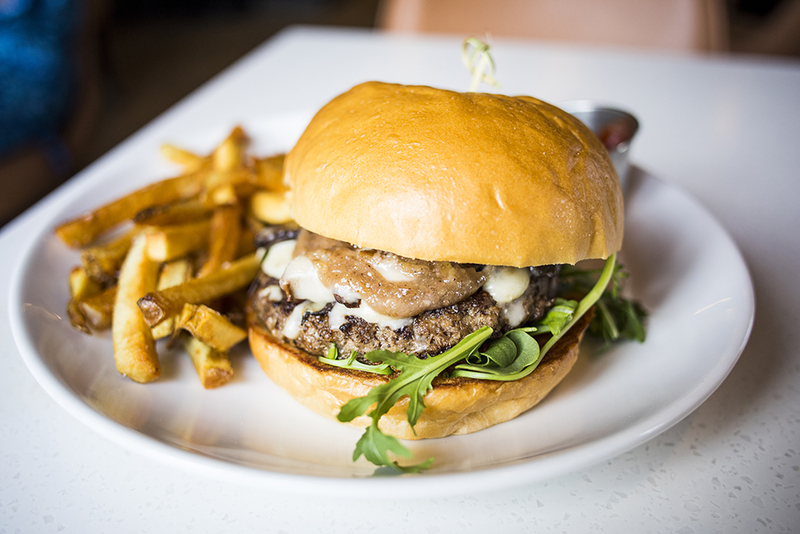 The Rock Elm Burger ($16) included MontAmore cheese, a silken pile of roasted mushrooms, a crunchy candied walnut aioli, and a bit of arugula for show. On paper, a salt bomb; on the plate, we missed salt almost entirely amid the storm of earthy umami. A few sprinkles of salt later, we had a great burger—fully flavored, tender, substantial, and certainly big enough (and structurally sound enough) to split. 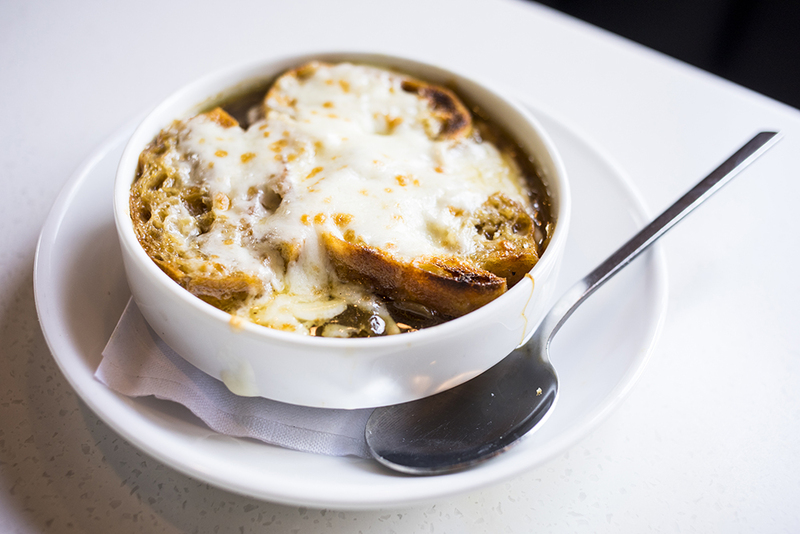 French Onion Soup ($7) featured deeply flavored broth, tender and skillfully melted cheese, and crispy-crunchy-yielding croutons. We could have used a bit more browning on the cheese, and yes, salt would have been a nice touch. Still, for a standard that tends to take a lot of abuse, it’s one of the better French onion soups we’ve had in restaurants. On our lunch visit, we plunged into the poutine ($13.50) with house cut french fries, braised wild boar, smoked gouda béchamel, and a runny fried egg. The meat was rich and tender but under-seasoned, and the béchamel lacked any smoky flavor. Gooier texture, more cheesiness, smoke, and salt all would’ve improved this dish which was, nonetheless, pretty good—the meat was savory, the fries crisp and tasty, and the egg perfectly cooked. As it turns out, a good upscale poutine isn’t a simple dish, and you do, in fact, get points for trying. 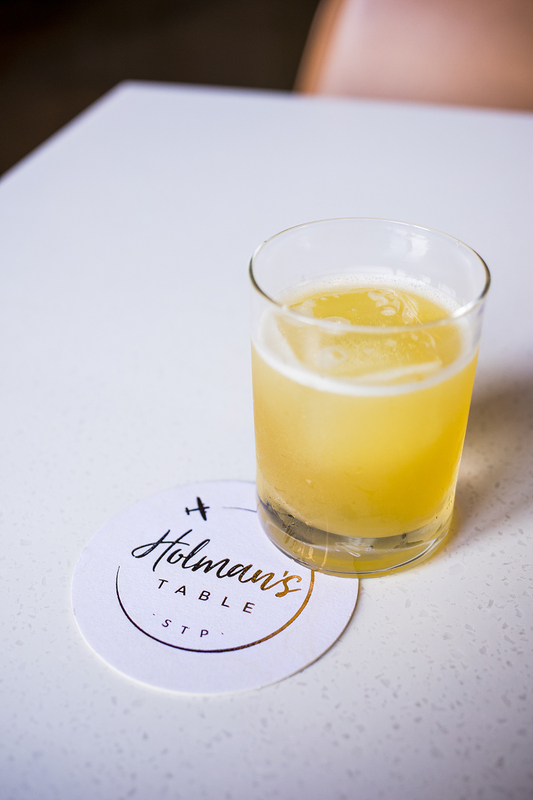 Our experience with the drinks at Holman’s Table was a mixed bag stuffed mostly with good things. First, the not-so-good: While our old fashioned ($11) was agreeably smooth and featured a nice bitter orange bite, it was drowning in simple syrup and light in alcohol to the point of resembling a mocktail. We’ve had $6 Wisconsin tavern old fashioneds that we’ve preferred, and those were dressed with 7-Up from a soda gun. Our Penicillin ($10), on the other hand, was a gem of a drink. Lemon, smoke, and honey blended in equal proportions and the alcohol (Peat Monster Islay Whiskey) came through without upsetting the applecart. We tried and quite liked two non-alcoholic drinks ($5)—the Barnstormer was tart with sumac and pomegranate, boasted a hint of smoke, and was dominated by well-sweetened cranberry and lime. The Parachute was bold and bright with ginger, lime, Angostura, and soda coming together to make an ideal summer cooler. In a part of St. Paul not overstuffed with fine dining, Holman’s Table offers some elegant choices at reasonable prices—the $24.75 hanger steak isn’t a steal, but it’s in line with other fine dining spots, and the upscale sandwich choices ($13.50–17.25) justify their existence with solid execution and premium ingredients. If you factor the view and the architecture into the value prospect, it’s one of the best deals in town, well suited to a “get away from it all” weekday lunch or a special dinner with the aviation nut in your life.